My dog has been getting the royal treatment lately! It’s much deserved, but I recently created an Raised Dog food Feeder to start his new pet station. I absolutely loved how it turned out, plus we’re finally utilizing an empty space in our kitchen. Not only is he getting a special area just for him he’s also getting the best food. I find mixing up the food he eats from time to time keeps him excited and interested in eating. 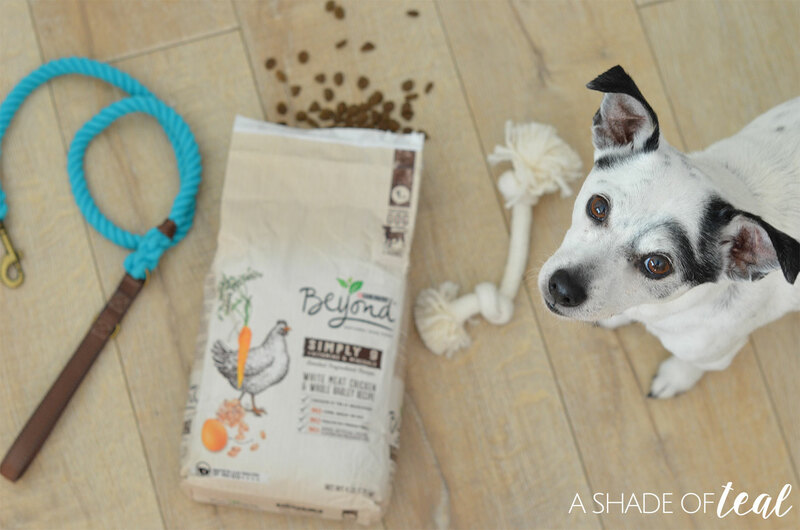 His latest favorite has been Purina® Beyond® in the Simply 9 White Meat Chicken & Whole Barley Recipe Natural Dry Dog Food. He’s quiet smitten with chicken being the #1 ingredient. 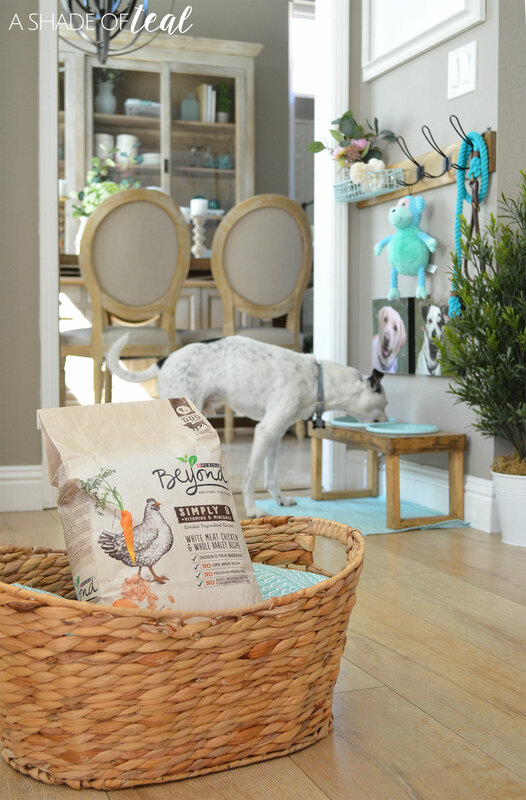 Not only is Purina® Beyond® Natural Dog Food’s # 1 ingredient chicken, it contains No corn, wheat or soy, No poultry by-product meal, and No added artificial colors, flavors or preservatives. 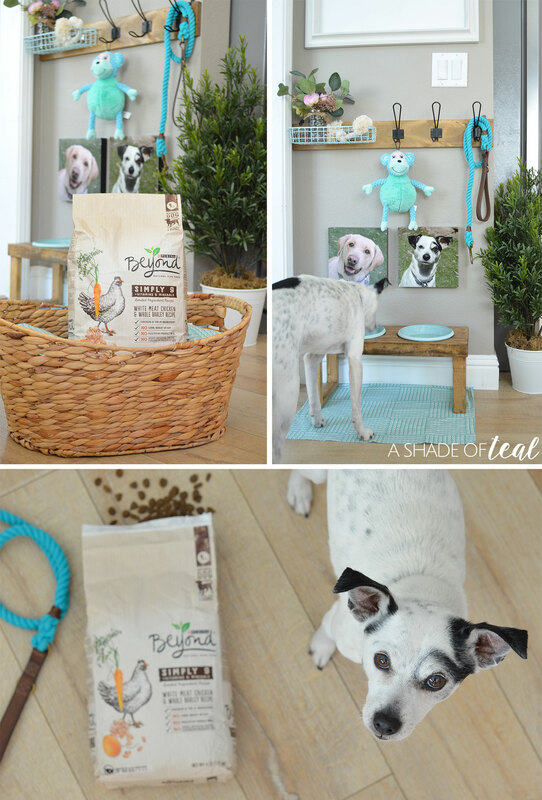 Your pup is sure to LOVE it! To add to his new space I wanted to create a place to hang up his leashes, favorite toys, and any other random accessories. So, my latest addition is a matching dog leash holder. Read on to get the full tutorial. 2 Plastic clear wall hooks, I found mine in a picture hanging kit. 2 Metal brackets, also found in a picture hanging kit. Step 1: Gather all your supplies. Step 2: Layout where you want everything to be. Step 3: Gather your small supplies such as the brackets and screws. Step 4: Stain the wood to the color your prefer, then spray paint your basket and the brackets. Step 5: Attach the wire basket with the 2 clear brackets. Step 6: Attach all the wire hooks. Step 7: Attach the metal brackets to the top at each side. This is how you can easily attach it to the wall. Once complete, go ahead and screw/nail the board to the wall. I recommend finding studs to mount it to. Then hang up your dog leash and their favorite toys and your good to go! I’m starting to think my dog has a nicer pet station than most rooms in my house! He’s definitely one lucky pup! Plus, I’m loving that we no longer trip over his bowls with his raised feeder, but having a designate space to hang his leash has been the best thing yet! I’m always that person who throws something down after using it; for it never to be found again. So this new leash holder makes me stay organized. This space has definitely become one of my favorites, I’m just glad my pup enjoys it as much as I do! 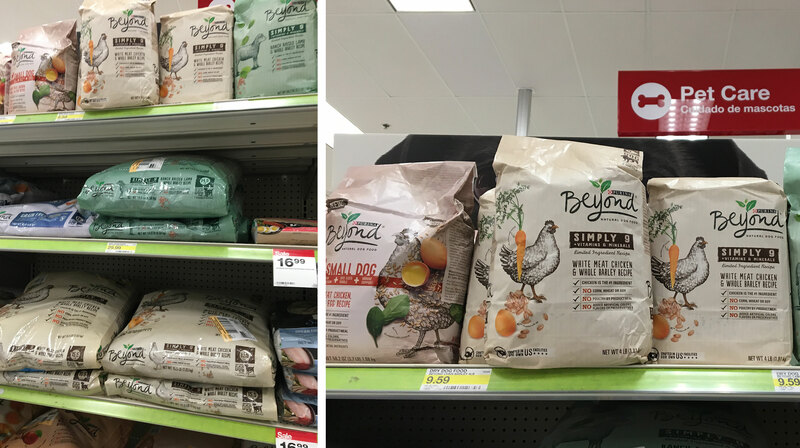 Don’t forget to pick up Purina® Beyond® in the Simply 9 White Meat Chicken & Whole Barley Recipe Natural Dry Dog Food in the pet aisle at Target. But no matter which selection of food you buy for your dog, Target offers an amazing variety of Purina dry dog food products. The best part, during all of March The Target Cartwheel app is offering a discount. If you don’t use Cartwheel yet you need to! So much savings with this app. Let me know what you think of my newest addition to my pet station. If you have any suggestions of what I should do next let me know! « Learning to Decorate with Color, find the Perfect Color for You! I think this is a great idea. 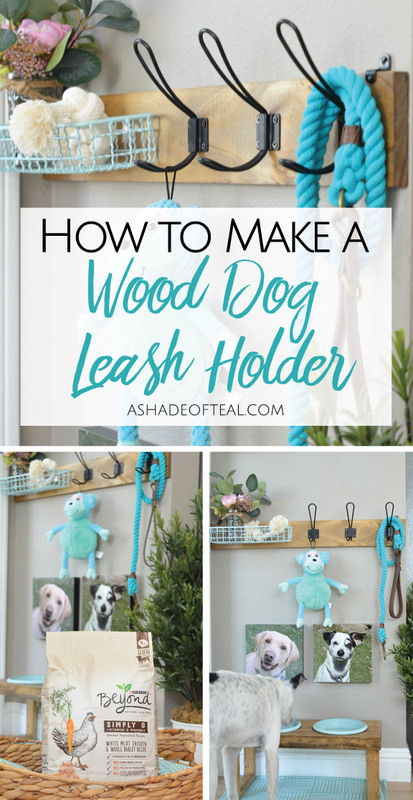 What a great way to organize those leashes. I love this space that you made for the dog. the pictures are too cute. I thought the pictures of the dogs just above the feed station were funny! Looks like a nice area for the dogs though! That is a genius idea! 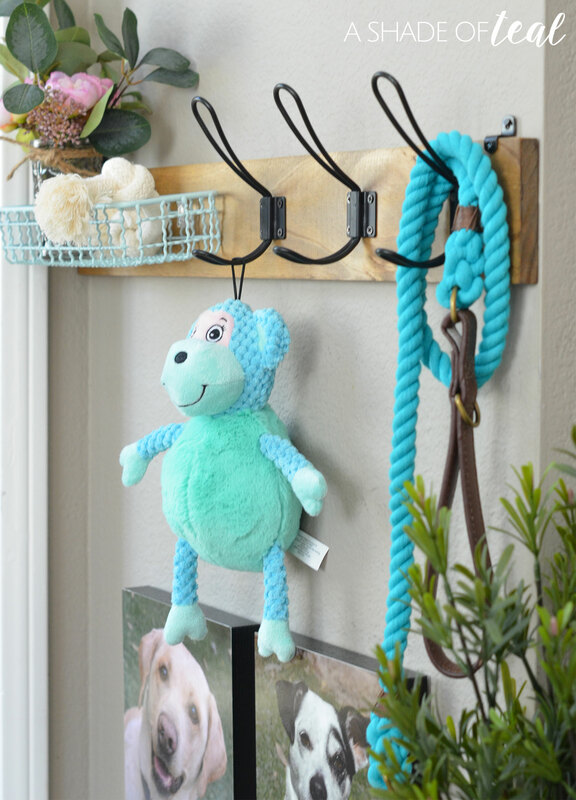 I am always losing my dog’s leashes, and this would be perfect for organizing my pups! Your decor is stunning, too! I will have to check out those dog feeders, too. Very cute! Thanks, I know what you mean. I think he’s more pampered than me! I really like how this turned out! It looks so organized and pretty. I love that you added pictures of your dogs too, that’s so adorable. The whole area is lovely! 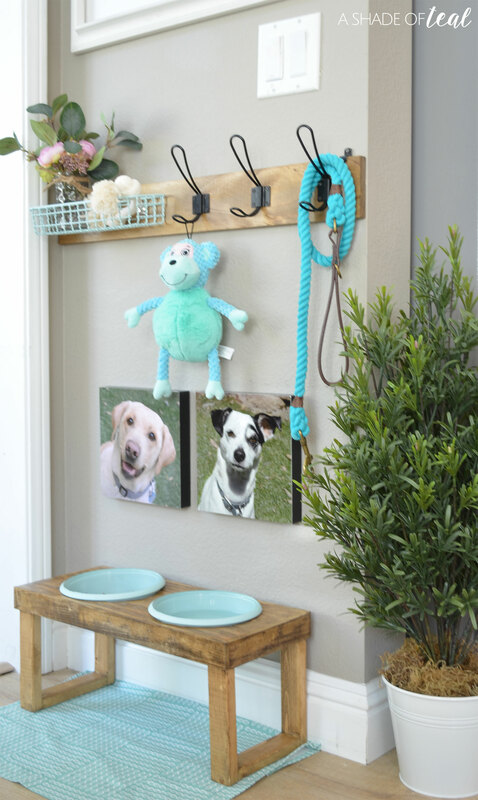 What a lucky pup to have the best dog station, an organized thing with that dog leash holder. A favorite food to munch and a perfect raised feeder. Thanks so much Sarah, he really is! This is just the cutest thing I have ever seen! I need to make one for my Rottweiler! Thanks Jay, you’ll love it! Oh what a lucky pup – this really shows what an important member of the family he is. I think this is such a great idea – very talented. I will have to share this with my mother! This is so nifty and looks easy to make! Thanks Wendy, it really is! Ah thanks Maria! He is!!! Thanks Lisa, it would be a great item to hang other things! 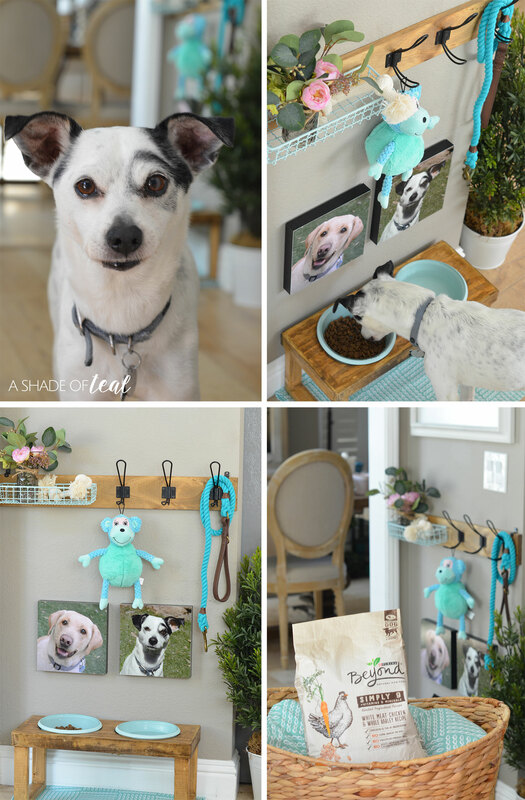 What a fun and cool idea, I’m pretty sure my dog will love this diy, it lloks neat and organize. Thanks Wendy, you’ll love it too! This is really neat and fun idea, I love it because it is vibrant and perfect for my dogs too. Your pup is so sweet! I love this idea, although I would have no reason to make one (I have a kitten) 🙂 I really love the colour – it’s perfect for spring! We are so happy to welcome a guest contributor today who is here to share such a cute idea for you dog owners out there. Omg this is awesome I am going to do one of these for my parents dogs. Thanks Lorena, I bet they will love it. This turned out beautifully! I don’t own any dogs, but I bet this would make a great gift for a friend who does! It would! Thanks for stopping by! Thanks Emma! I know, I think I might make another holder for all those things! Super cute, we want to make one and put in our mud room but I can not find the hooks you used anywhere . Could you please share your source to finding them? Thank you. Hi Jamie! I found them at Hobby Lobby on a premade hook rack. I actually bought the wall rack with the intention of just using the hooks! But I do think Hobby Lobby also sells a similar individual hook that’s slightly bigger. Please do more dog tutorials! This is wonderful. I plan to make this and the raised dog feeder once i finish moving. Where did you get your dog leash? I believe it was Petco. Looks great! Where are the wire hooks from? Thanks for sharing! What a fun and simple craft to make !